The number of resolutions on corporate political activity has risen some this year after gradually falling from a high in 2014. Lobbying and election spending continue to be the main issues and intense public discord in the political arena seems certain to keep the issue on annual meeting agendas. 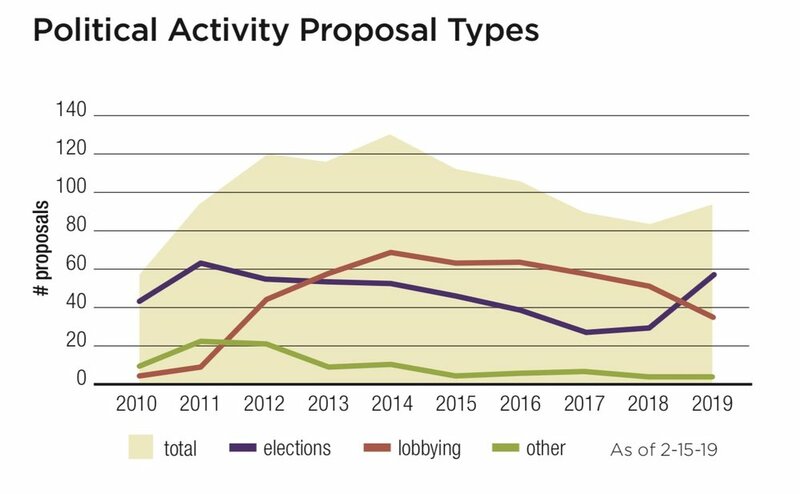 Requests for corporate oversight and disclosure of about election spending are more common than those for lobbying, although it remains true that lobbying budgets dwarf those for elections. Transparency is increasing some, but most companies still are reluctant to disclose memberships and payments to intermediary groups that legally may shield their funders—trade associations, “social welfare organizations” (known as 501 (c)4 groups for their tax exemption in the Internal Revenue Code) and charitable groups such as the American Legislative Exchange Council (ALEC) that skirt political activity prohibitions. Shareholder proponents include social investment and religious organizations, leading pension funds such as the New York City pension funds and NYSCRF, trade unions and some individuals. Investor concern about corporate election spending began in earnest when the Center for Political Accountability (CPA) started in 2003 and intensified after the Citizens United U.S. Supreme Court decision in 2010. The CPA’s model oversight and disclosure approach is the standard template for lobbying transparency, too, and forms the basis for the lobbying disclosure campaign run by Walden Asset Management and the American Federation of State, County and Municipal Employees (AFSCME). The umbrella Corporate Reform Coalition supports shareholder activity on corporate spending and includes other reformers, as well. Key references for investors are the CPA’s CPA-Zicklin Index, most recently updated in October 2018, covering the S&P 500 index. The Conference Board’s Committee on Corporate Political Spending offers a more corporate but generally supportive perspective on disclosure and oversight, but it has had little recent activity. Multiple proposals: Since 2013, proponents have been able to file both election spending and lobbying proposals at the same company; before that the SEC judged them to have such substantial overlap that a company was allowed to omit the one it received second. This year five companies have two such requests— American Water Works, Duke Energy, ExxonMobil, Ford Motor and Nucor. In addition, both Honeywell and Pfizer received proposals from free market proponents that use the same resolved clause as the AFSCME/Walden version, while praising each company’s lobbying efforts. (See Conservatives section for details.) These “copy-cat” proposals, if received before those from the main campaign, can bump off the duplicative proposal, as happened at Duke Energy last year. The Center for Political Accountability and its allies, a wide variety of institutional investors, are continuing the campaign begun in 2003. Nineteen of the resolutions are resubmissions (one is not public). The lobbying transparency campaign is coordinated by Walden Asset Management and the American Federation of State, County and Municipal Employees (AFSCME). Congruency: NorthStar Asset Management has a new proposal at Intel that raises its longstanding concern about consistency between companies’ public policy positions and their PAC and corporate spending, while also resurrecting the idea that shareholders should be afforded an advisory vote on prospective corporate spending.